Lisa of Tomato Thymes in the Kitchen and Andrea of The Kitchen Lioness were the hosts this week. 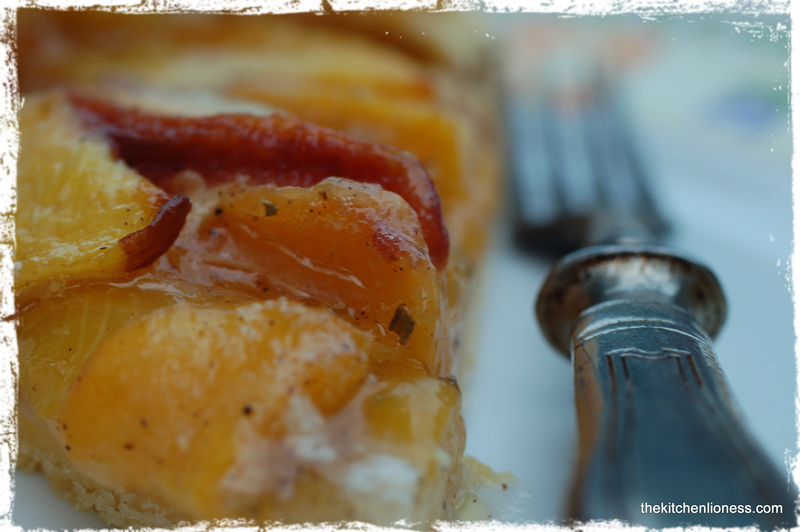 Andrea made the gorgeous galette below. Leave your link so we can find yours. No chat, please! Loved this recipe! Made mine with fresh figs, came out wonderful! We loved this one too! I used raspberries and blueberries. I also tried the tomato cheese galette with the leftover dough. Will post at midnight pacific time. Oops. forgot to click on follow-up email! I had mixed feelings about this one. Delicious! A ‘pie’ I can make. Had trouble with the dough but this turned out to be tasty. I made an apple galette! I loved making this & look forward to making another one in the fall! Two delicious Galettes – perfect treats in the wonderful month of August! Loved everything about this recipe. I will make it many more times! This was oh so summery. Mmmmmm!! I made an apple galette and it was scrumptious! I also played catch-up a little bit this week. Here’s the link to my Blueberry Nectarine Pie! no local berries for me right now, but had backyard plums! Our gluten free take with apples and plums. Absolutely delicious! I promise next recipe, no changes! This was a good bake!! Wonderful – going to eat a piece right now! Finished! I made Peach Melba. We LOVED it!!! Very yummy and super easy. Whew! Thougth I could make it by Tuesday, but time got away on me! I’m a bit late, the two recipes in two weeks threw me for a loop. I made it gluten free and will make it again! glad to know i am not the only one who overslept! Here’s my link! I used blueberries and strawberries. A little late posting due to life. Did bake on Tuesday though. I’m late in posting too but I’m glad that I made the galette, it’s simply delicious! i also totally didn’t realize we were posting this week… must pay attention! I finally got around to making this. It was small, but really delicious! She’s backkkkkkk……. this bebe galette was a winner for sure! “Better late than never.” Who said that? A week late on my post but we loved this recipe. Can’t wait to make again. Tomato or peach? Sorry that I am late this time.. Here is my plum galette.. Loved it..